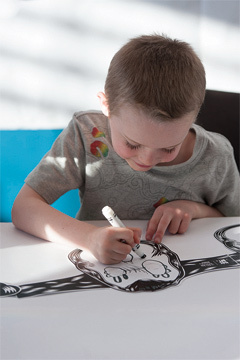 Cartoon Connection: Art by Kids 4 Kids showcases comics created by children at the Redland Art Gallery during recent school holiday workshops. Under the guidance of a professional artists, local children took part in Kids’ APT7 on Tour, a program of activities developed by contemporary Australian, Asian and Pacific artists in conjunction with The 7th Asia Pacific Triennial of Contemporary Art (APT7) at the Queensland Art Gallery | Gallery of Modern Art in Brisbane. This exhibition brings together their responses – comics telling their own unique stories created with newly discovered styles and techniques. Images: Uji Handoko Eko Saputro (aka Hahan) Children’s workshop, Memento masko 2012 and Pong Pongan (Kids’ APT7 mascot) (detail) 2012. Images courtesy QAGOMA photography.